Obrist appeared on the horizon of the art scene at the beginning of the 1990’s, when he organized his first exhibition in 1991 – in his own St.Gallen kitchen, attracting 29 visitors in three months. The kitchen exhibition would later serve as the key to his work, in which huge projects are alternated with miniature and intimate expositions, say, in a hotel room (Hotel Carlton Palace: Chambre 763, Paris, 1993). In Latin, the word curare means “to take care of” (as well as “to heal” and “to govern”). A curator takes care of art works in the classical sense, for example, as it is done in museums. Curators also take care of the artists themselves, as Maria Lind, the Director of Stockholm’s Tensta Konsthall, indicated in an interview with Arterritory.com: “I am convinced that to be a curator means to help the artist, and to ensure him/her with the best working conditions possible. But at the same time, it is important to confront the artist with difficult questions, thereby challenging the artist a bit – at least until it seems fruitful.” At the beginning of his career, Obrist also posited a similar motto, or wish – to help artists realize their dreams. Curators really do seem to be much like fairy godmothers. It should be said that the above-mentioned Szeeman is justifiably seen as one of the first independent curators to hold the powers already described in the beginning of the article. “In 1972, artists reacted to documenta5 with boycotts and open letters, protesting against Harald Szeemann using artists like paint on canvas, and otherwise overreaching, to use Vidokle’s term. It’s unfortunate that such an uproar is unimaginable today. Which is to say, I agree with many of Vidokle’s points. The thick oral history of curators abusing their prerogatives is growing thicker by the biennial, while art is widely employed to boost curatorial reputations for multi-knowledgeability and to ennoble semi-academic careers. And the idea of a happy, level playing field between artists and curators is indeed far too pastoral. However, even more startling is the idea that curators getting-out-of-the-artist’s-way will remedy the situation,” writes the independent curator, Tirdad Zoghadr, from Berlin, in a reply to Vidokle. A PEDESTRIAN BRIDGE, OR A SPRING-BOARD LEADING INTO A CHASM? In taking a historical step backwards and searching for both the objectives and limits of power that a curator should have, one can say that, in short, along with the bringing of Marcel Duchamp’s “Fountain” (1917), or urinal, into the realm of art, there arose the acute necessity for a mediator between the public and art. “However, the autonomous modern art object, free from royal patronage and religious significance, demanded increasingly to be interpreted and explained. Thus, over time the curator came to not only present the artwork, but also explained why and how it is art. The blurring of the boundaries between art and life and the ready-made gesture on the one hand, and the disputed futility of avant-garde committed art and its social promise, on the other, increasingly generated the need for curatorial contextualization and interpretation,” writes Sohrab Mohebbi, a writer and curator from Brooklyn. 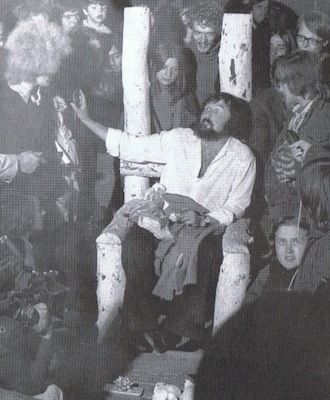 Left: documenta5 curator Harald Szeeman, in the “throne” of art, 1972. Right: documenta13 curator Carolyn Christov-Bakargiev, in her “throne”, 40 years later. In the latest issue of “Texte Zur Kunst”, on the cover of which is the currently-hot-topic of “The Curator”, is an article about Hans-Ulrich Obrist. In speaking of Obrist’s work and how it relates to both the viewers and the artists, the author of the article, Heinz Bude, writes: “The point is not to pull the rug out from under the feet of the naive believers, but to offer arenas for the participants in which they can meet, see each other, and exchange ideas.” But as I write this article, there’s a National Geographic program on TV, about the “Ghost Bear”. It’s the same North American black bear, just endowed with a unique, recessive gene that causes its fur to grow almost white in color. And instead of blending in with its environment – which consists of moss, lichen, pine trees and brush – and being present within it, the bear wanders around like a ghost, as if it were lost and incongruous.